Which First Lady helped to choose the first china pattern that was created specifically for an American President? Elizabeth Monroe, wife of James Monroe, ordered the china from France in 1817. It was manufactured by the Dagoty-Honoré factory in Paris. Which First Lady helped choose the first china to use the American shield? 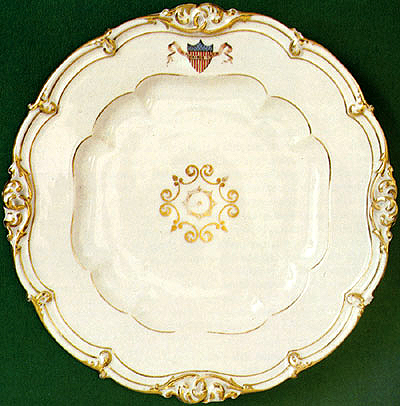 Sarah Polk, wife of James Polk, ordered this china from the same factory Mrs. Monroe used in Paris. It was purchased in 1845. What is considered the most “unusual” White House China pattern? The Hayes china, chosen by Lucy Hayes. The china’s creation came as a result of a chance meeting between Lucy and artist Theodore R. Davis in 1879. 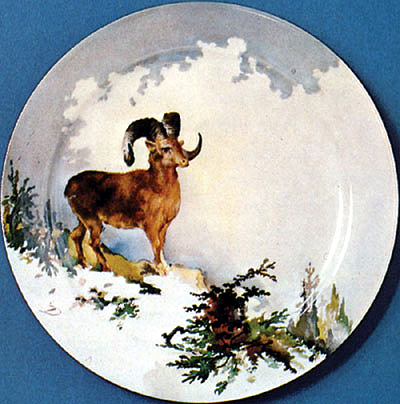 Mr. Davis suggested using the flora and fauna of North America as a décor for the new china. She agreed and Mr. Davis eventually produced 130 different designs of American plants, animals and scenic views. He also created unique shapes for the fine china. The art critics were severe in their reviews, but the service was well liked by the general public. Which china incorporated a President’s favorite flower, which his wife wanted made the National flower? First Lady Caroline Harrison chose this china which featured the U.S. 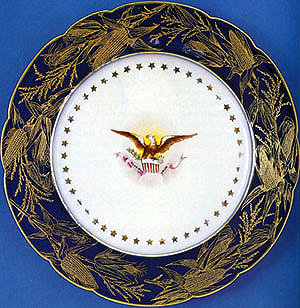 Coat of Arms for the center of the plates, and to compliment it a corn and goldenrod motif etched in gold around a wide blue band. Sadly, Mrs. Harrison was never able to dine on the china as she passed away 2 months before it was delivered. Which china was the first to be made in America? Edith Wilson chose the china in 1918 which was manufactured by Lenox, Inc. in Trenton, New Jersey. Which first lady was a British subject and the daughter of a British army officer? Elizabeth Korthright Monroe’s father served with the British Army during the American Revolution. Lawrence Korthright was a captain in the army who remained loyal to the King. He was a wealthy Tory merchant who saw most of his fortune confiscated during the Revolution. Which first lady interviewed her future husband for a newspaper before he became president? Jacqueline Bouvier was an inquiring “camera girl” for the Washington Times Herald shortly after her graduation from George Washington University in 1951. That year she interviewed Congressman John F. Kennedy. She married Kennedy in 1953 in Newport, Rhode Island. Which first ladies were divorcees when they married their husbands? Florence “Flossie” King DeWolfe, a divorcee with one son, married Warren Harding, five years her junior in 1891. Elizabeth Ann Bloomer divorced her fist husband, William Warren, in 1947; she married Gerald Ford a year later. Which first lady was the first first lady to earn a graduate degree? Pat Nixon was the first United States First Lady to earn a graduate degree. Following four years of study at the University of Southern California she graduated and became a teacher. She continued to teach for the first year of her marriage. Which first lady was once national president of the Girl Scouts? Lou Hoover, a graduate of Stanford, served as president of the Girl Scouts while her husband was secretary of commerce under Harding and Coolidge. …that in her youth Jane Pierce was considered such a good pianist that she was encouraged to consider a musical career? …that Lucy Hayes thought herself “too light” to be married to Rutherford B. Hayes? By “light” she meant her mind being too lightweight. …that Sarah Polk disagreed with her husband about banks? She encouraged him to put their money in the bank - he preferred carrying it with them in their luggage. …that Florence Harding supported herself, after being abandoned by her husband, giving piano lessons for $ .50 an hour? One of her students was Warren G. Harding’s sister, Charity. ...that Abigail Fillmore, a former schoolteacher, obtained congressional funds in 1850 for the first official library in the Executive Mansion? ...that Grace Coolidge was a former teacher of children with hearing impairments at the Clarke School for the Deaf, and became one of the school's trustees after her tenure in the White House? Martin Van Buren’s wife—his second cousin—died 18 year before her husband was elected president. Their daughter-in-law Angelica Van Buren served as White House hostess during the last two years of the Van Buren administration. Andrew Johnson’s wife taught her husband how to spell and pronounce words properly, but tuberculosis prevented her from being hostess, a role assumed by their daughter Martha Patterson, who milked cows at the White House every morning. Grover Cleveland’s wife was the youngest first lady—age 21—and the only bride of a president to marry—and give birth—in the White House. Before their marriage, Cleveland’s sister Rose Elizabeth Cleveland served as House hostess of the bachelor president. Ronald Reagan’s wife worked as a professional actress, appearing in movies and in a music video—an anti-drug abuse message.